The diameters, radii and circumferences of Stonehenge’s Outer Bank, Ditch, the Inner Bank and the Sarsen Circle conform to the factors of the 3 hexagons which symbolize the silhouettes of the 3 cubes. Cube B and Cube C have a remarkable relationship to Silbury Hill’s design. The Great Pyramid’s full design has a remarkable relationship to Cube A and Cube C.
Hexagon A is the only regular hexagon that fits tangent inside the 3168 Roman digit radius Outer Bank, each face of the hexagon is also 3168 Roman digits, the hexagon’s 1140.48’ perimeter = the Outer Bank’s inner circumference which is also the Ditch’s outer circumference, the hexagon’s area = the area of the hexagon = the area of a 345.6’+ diameter circle and 345.6’ is the inner diameter of the Ditch and also the outer diameter of the Inner Bank. Hexagon B is the only regular hexagon that fits tangent inside the 316.8’ diameter crest of the Inner Bank, each side of the hexagon is 0.03168 Old English miles same as the crest’s radius, the hexagon’s perimeter = 316.8 yards which is the mean circumference of the Inner Bank’s inner face (important) the hexagon’s area = the area of a 3456”+ diameter circle and the Bank’s inner diameter is 3456”. Hexagon C is the only regular hexagon that fits tangent inside the Sarsen Circle’s outer circumference, it’s 316.8’ perimeter = the Sarsen Circle’s mean circumference, the hexagon’s area = the area of a 96.0’+ diameter circle, the Sarsen Circle’s inner diameter = 96.0’+. The outer perimeter of Silbury Hill’s hill top as left by the builders was a 316.8’ circumference circle and the centre of the hill top was 31.68” or 1 Gunter pace higher, the outer level’s circumference was the same as the mean circumference of Stonehenge’s Sarsen Circle and symbolizes the same thing which is the 316.8’ perimeter of a regular hexagon that symbolizes the silhouette of a 633.6” cube (Cube C). 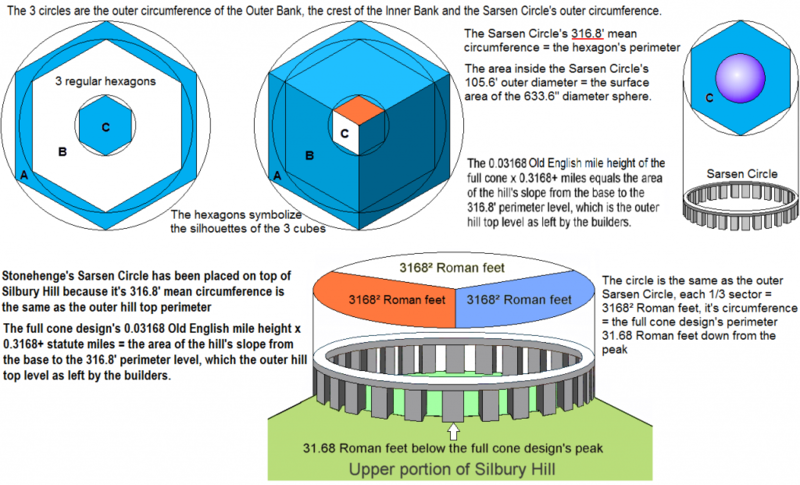 A plan of Stonehenge’s Inner Bank’s crest, the Station Stone Rectangle and the outer circumference of the Sarsen Circle are are centred on the centre base of Silbury Hill’s vertical section, the cube and sphere symbolized by the Sarsen Circle’s design are also shown. The two spheres below right demonstrate the height of the full cone design, the size, the shape and elevation of the upper hill top level which is the same as the top 31.68” of the 3168” diameter sphere which protrudes 31.68” through the 316.8’ perimeter outer hill top level, the circumferences of the two spheres and the base of the upper level are all exactly the same on the elevation of the 316.8’ perimeter level. Note that the centre of the 316.8” radius sphere is on the centre of the hill top as left by the builders which is 316.8” below the full cone design’s peak and the sphere’s circumference on the outer level = the base perimeter of the upper level, these are the factors of the hill top design that symbolize the 316.8” radius sphere. The surface area of the 316.8” radius sphere = the area of a 105.6’ diameter circle, the outer 105.6’ diameter Sarsen Circle’s area symbolizes the sphere’s surface area. The 633.6” cube around the 633.6” diameter sphere below is the same as Stonehenge’s Cube C which is symbolized by the Sarsen Circle and remember it is a model of a 1 mile = 63360” diameter sphere inside a cubic mile which is an inch to the furlong scale model of the earth. The standard way to calculate the volume of a cone is pi x radius squared x height then dividing by 3 = volume. Therefore if we multiply the area of a 1/3 base sector by a cone’s height we produce the cone’s volume, this is interesting concerning Silbury Hill’s full cone design because it is 0.03168 Old English miles high and 0.003168² Old English miles is the area of a 1/3rdbase sector so 0.03168 Old English miles x 0.003168² Old English miles produces the full cone design’s volume. Silbury Hill has a special slope angle and to calculate the volume of any cone with a tan 0.576 slope angle you just cube the height and divide by 0.3168, so to produce the the volume of the full cone design is 0.03168 Old English miles x 0.03168 Old English miles x 0.03168 Old English miles ÷ 0.3168 = volume, do you get the impression the Designer of Silbury Hill is trying to tell us something? Note that Silbury Hill’s design focused attention on 1/3 sectors of circles which are a mathematical factor of any cone this gives us an excuse (if we need one) to divide circles into 1/3 sectors which is why we divided all those circles in previous pages into 1/3 sectors and the Great Pyramid’s full design told us to look at quadrants of circles.